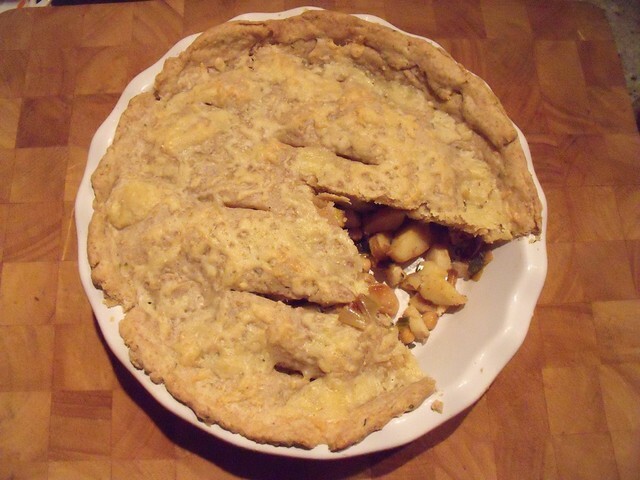 This pie is based on my WWII Woolton Pie. 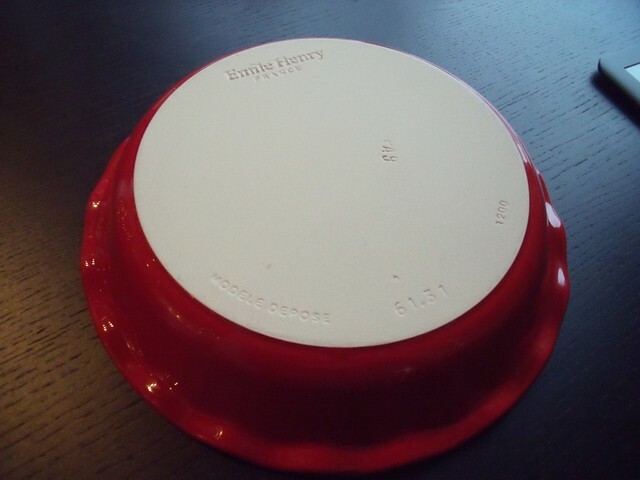 As back during WWII, the British were eating under food rationing, they often made pies with a lid and no bottom crust. 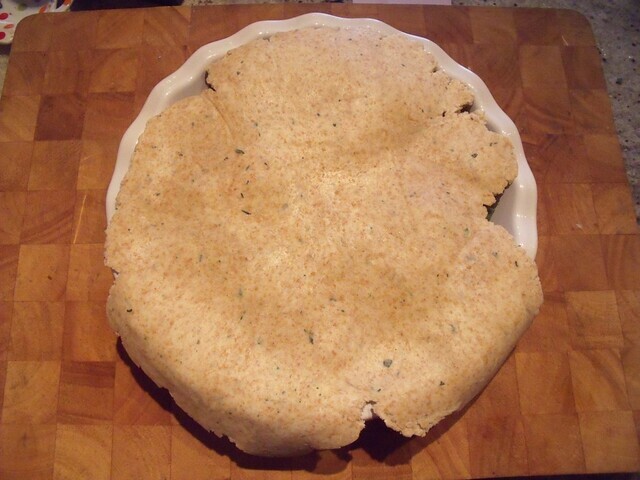 We’ve gotten used to it around here, and do most of our savoury pies with only a top crust. If you want a double crust (top and bottom!) 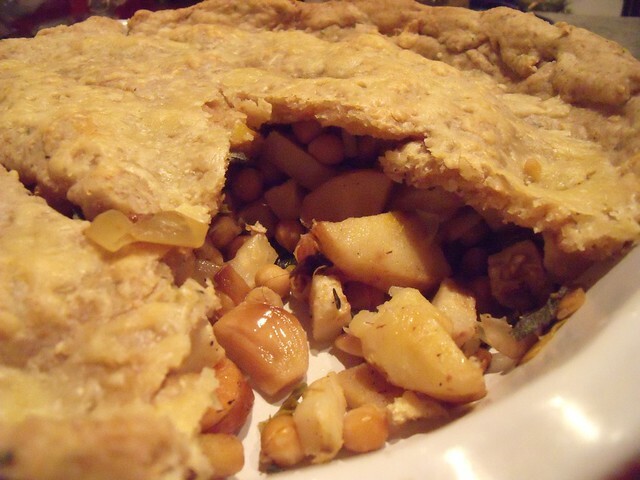 you can double the Thyme & Sage Whole Wheat Pie Crust recipe below. 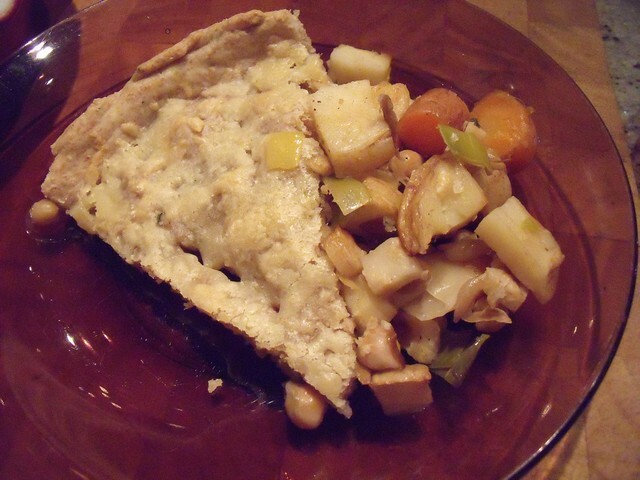 I used roasted root veggies here, instead of boiling them like for Woolton Pie. I like the caramelised bits that form on the leeks here, it’s extra delicious. 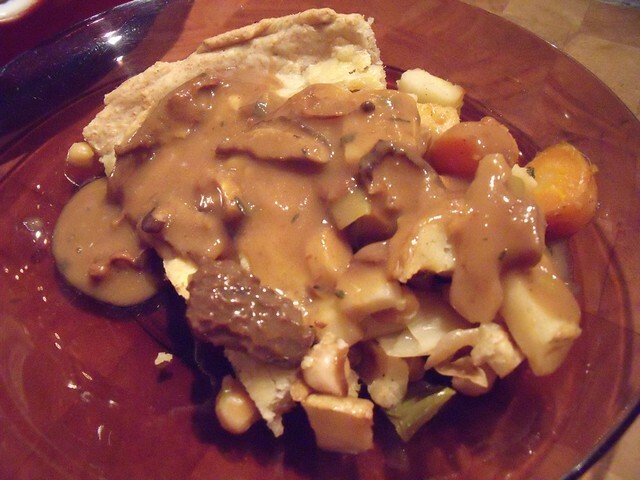 I love to serve this pie with a mushroom gravy — I used some dried mixed mushrooms I had on hand, including morels, my favourite! 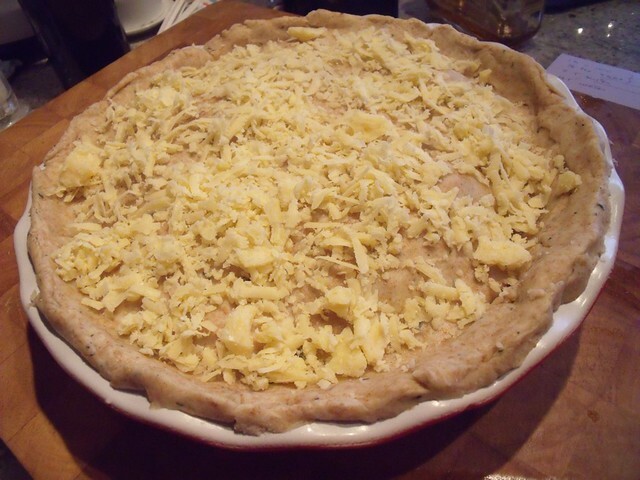 And the top of the pie gets a sprinkling of grated cheddar cheese. 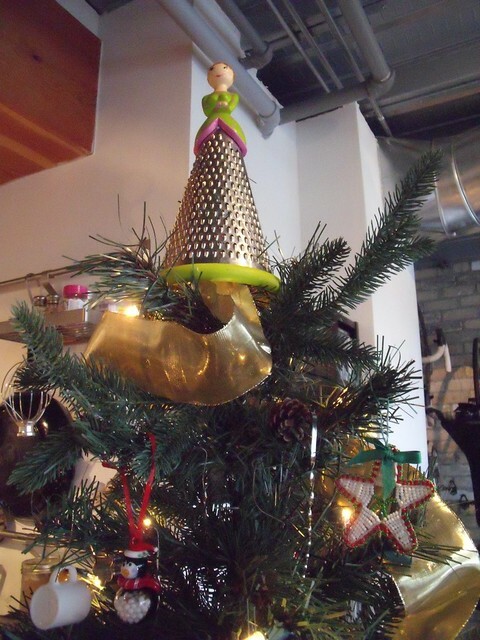 My cheese grater had to be taken down from active duty as Christmas tree-topper, in order to do some grating. Isn’t she lovely? We call her the cheese lady. She was a Christmas prezzie from the boyfriend a couple of years ago, when I was complaining about not having a tree topper, and saw one of my favourite kitchen shops using her in just this way! Perfect for our home! 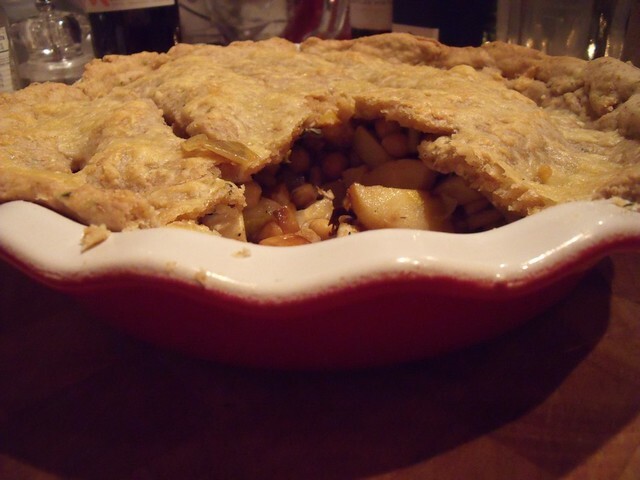 And you know what, this savoury pie wass a perfect way to inaugurate my new Emile Henry 9-Inch Pie Dish that I received from Heather for Christmas! And the cherry red colour. The inside is glazed and the bottom is unfinished. LOVE. 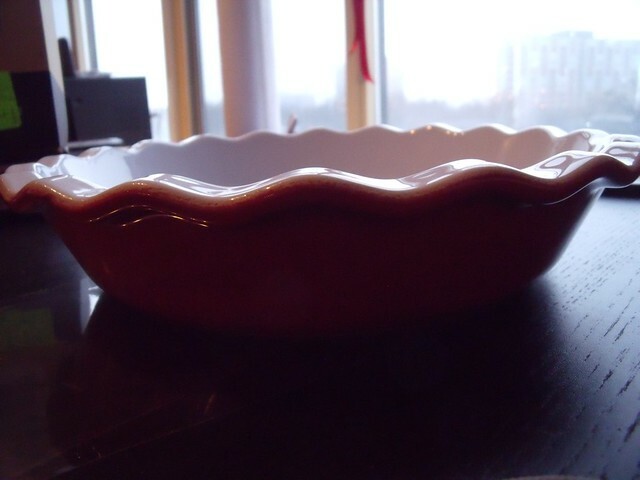 I can’t wait to make a Clafoutis in my new pie dish! And tons more savoury pies — I’ve been thinking about a mushroom & leek pie, or another swiss chard pie or maybe even a sweet pie (rhubarb and strawberry? sour cherry? lemon meringue?)! Oh the pie options! I can’t wait! 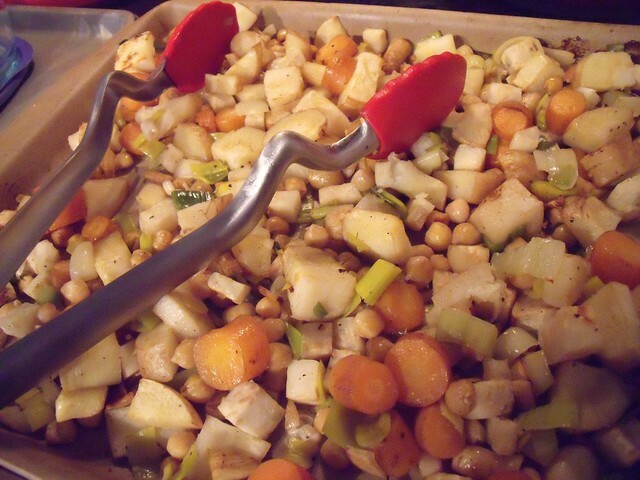 Combine parsnips, carrots, celeriac, leek, garlic, chickpeas, oil, salt & pepper in a large bowl. 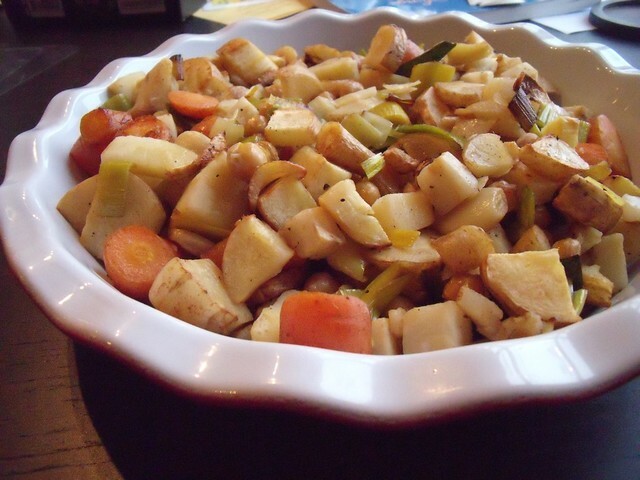 Spread in a single layer over a baking sheet (or two) and roast at 425F for 30-40 minutes, or until the veggies are fork-tender and beginning to caramelise. 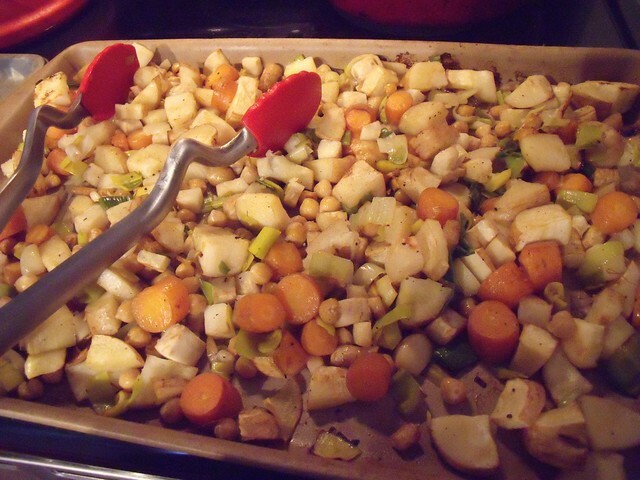 Throw your roasted veggies into your pie dish (there will be no bottom crust). 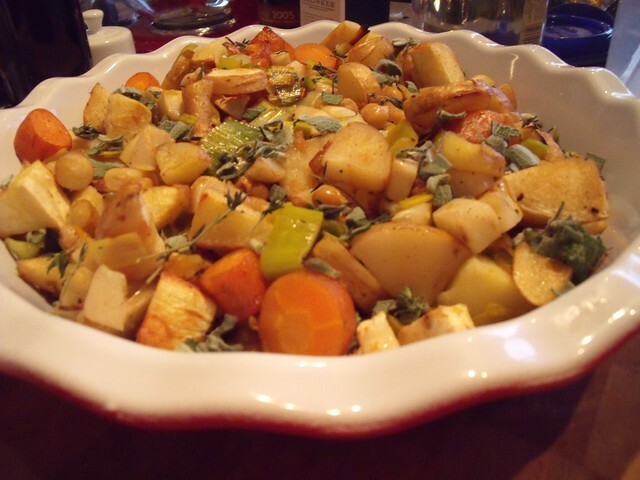 Top with the thyme and sage. 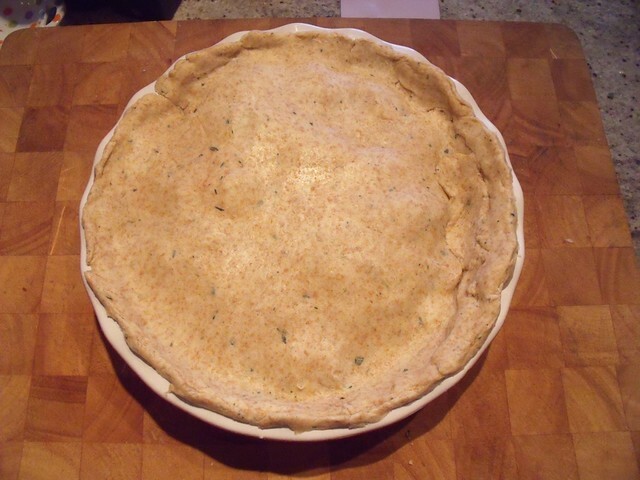 Roll out your Thyme & Sage Whole Wheat Pie Crust Dough into a circle large enough to cover your pie pan, with an extra 2cm (1″) all around the edges. 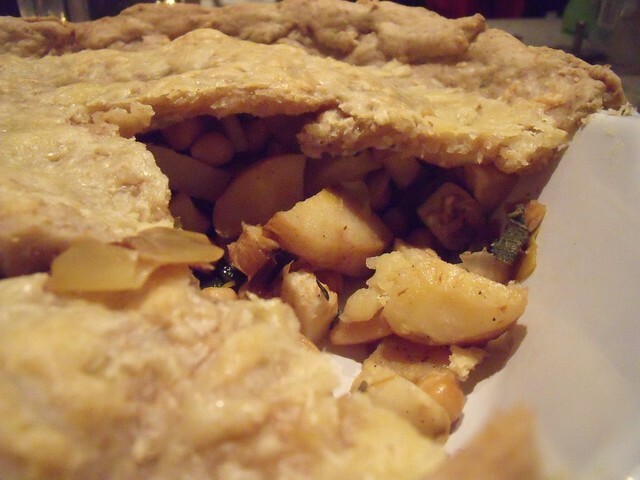 Plop it onto your pie to make a lid – this doesn’t have to be pretty. Now make it pretty by pressing the edges into the side of the pan. 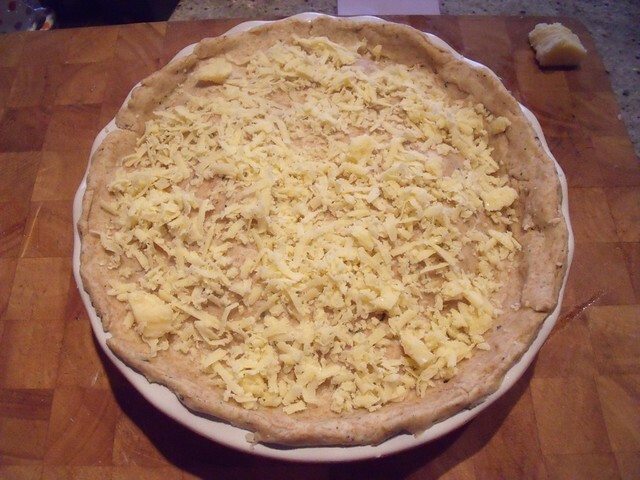 Cut slices with a sharp knife into your crust lid to allow steam to escape. Bake at 375 for 30 minutes, until the top is golden. 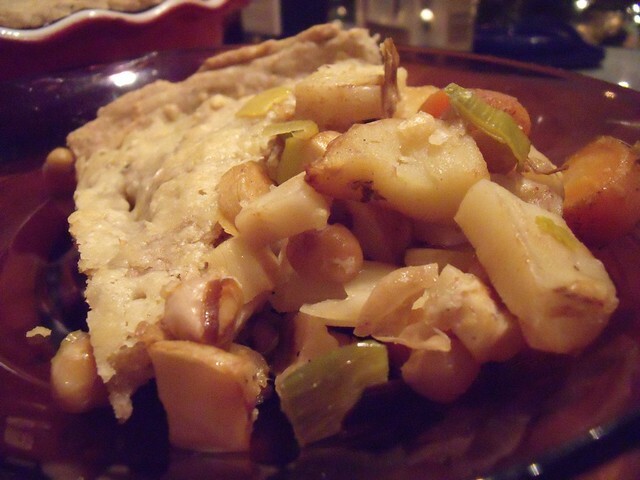 Serve warm with your favourite gravy (may I recommend my mushroom gravy?) and enjoy! 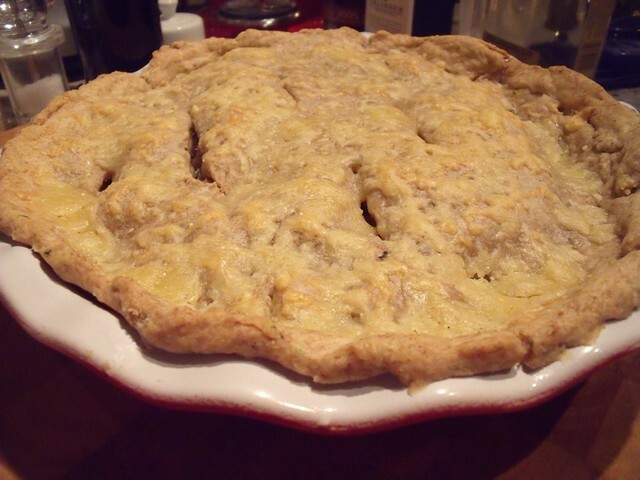 Adapted from Whole Foods’ Whole Wheat Pie Crust recipe. Makes enough to top a 9″ pie. 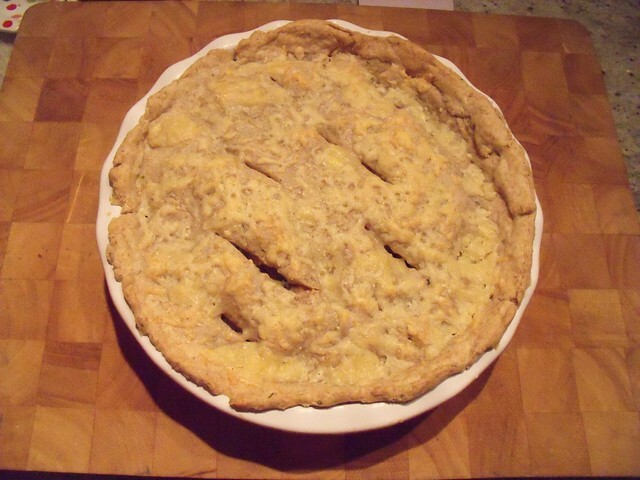 If you want a bottom crust too, double the recipe. 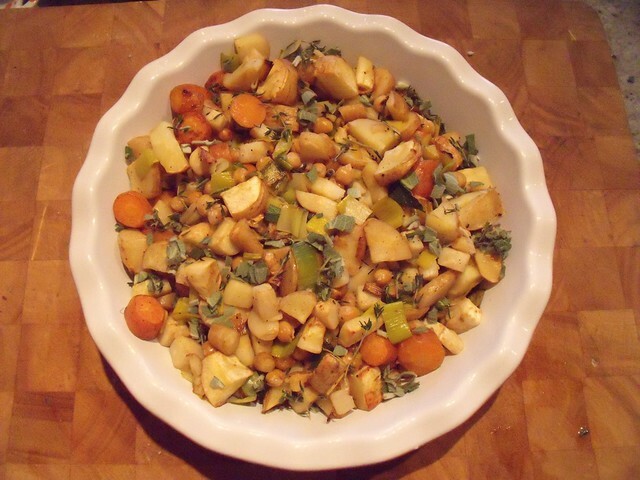 in a large bowl or food processor, combine flour, salt, thyme and sage. Add butter and pulse in food processor or combine with a fork or pastry blender until incorporated. Sprinkle water over top of the mixture and let sit for 30 seconds. Mix until the ingredients form a ball. 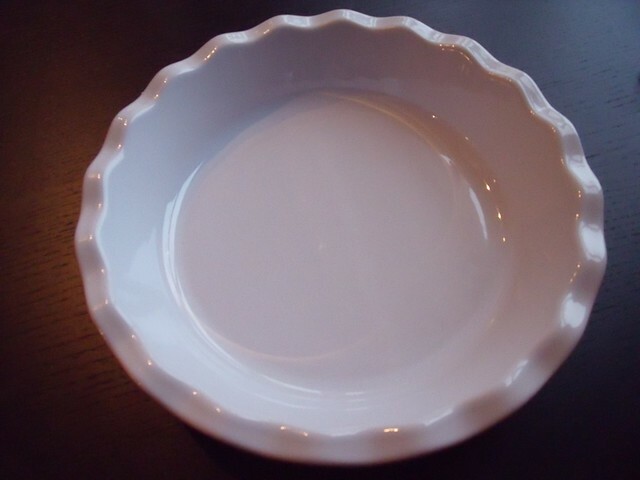 Turn out onto the counter, and form into a disc. Let rest in the fridge for 30 minutes. Use in your favourite savoury pie recipe. 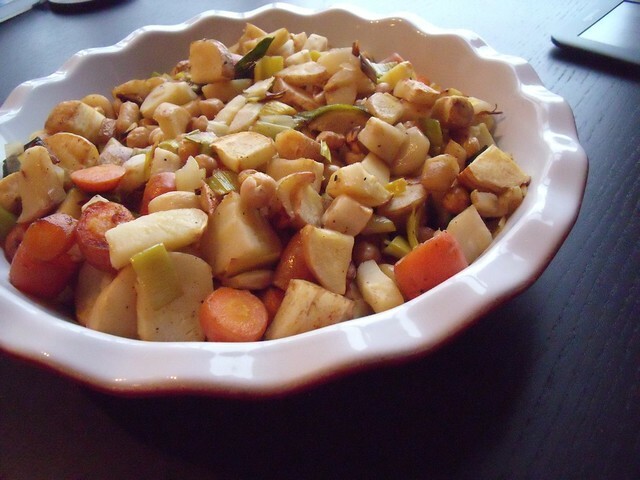 Holy yum that sounds amazing and just like what I want to make — I’ve got some chestnuts that need a home! 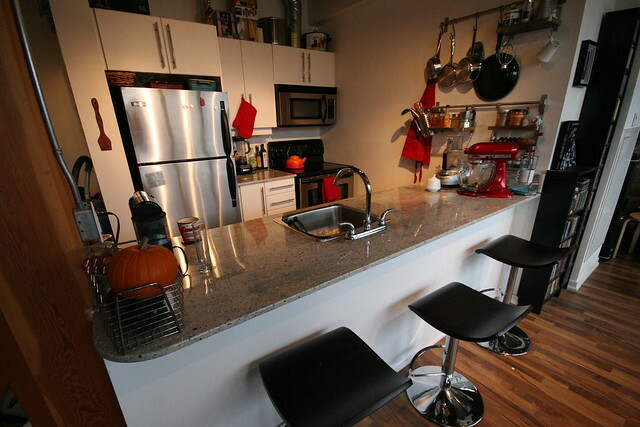 I’ve inspired myself back… Heather and I are making a mushroom version tonight. But I CANNOT wait to see your version!!!! So glad you’re blogging it!